High school sports are usually the one thing high school attendees look forward to. Looking forward to playing sports is not a bad thing, but there are consequence definitely that comes with playing sports. Overworking your body is the cause of what is happening to young teens who participate in sports. Overworking t is a way to higher your risk in injury. Do not try to do all of your training at once, limit yourself to only a few things at a time. Lets say you were hurt playing a sport, and all you have to do is sit out for the rest of the season. Sitting out may not sound so bad at the moment, but think about years later. Years later, as your body continues to grow and develop into a more mature stage, a small injury can affect the possible outcome of the bodies functions. An injury will also determine how your body will react to those injuries in later years. Take football for instance, Football is brutally physical, with physical collisions between players a regular part of the game. A tackle that leads to a concussion, can last for years after the original head trauma. 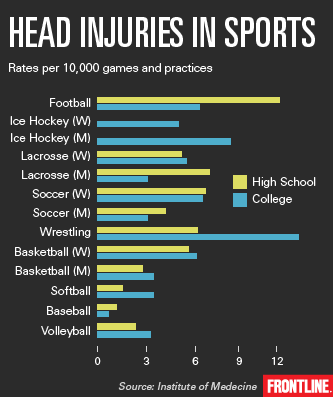 Even when the symptoms of a concussion have appeared to have gone, the brain is still not fully developed. So see a doctor, and get to a specialist. They will give you an ImPACT test—just like the pros—or a similar assessment to determine how badly you’ve been hurt. Then they’ll develop a recovery plan to get you back on the field. If not treated, concussions can drag down your work and social life—but proper therapy will shorten the amount of time you’ll have to live with the effects of the big hit.